In the natural stone category, granite is the most preferred material to create countertops all across the globe. Regardless of the kitchen size (spacious or confined) and location (interior, semi-open or fully open), granite stone countertops performs well in any situation. Though granite is found in many parts of the world, it is the Indian granite that is highly admired for its enticing colors, streaky patterns as well as quality. To buy granite stone countertops for your kitchen, you can contact any granite supplier and exporter from India that has an excellent track record of supplying quality granite products in your country within the specified frame of time. The suitability of granite for spaces like kitchen can be attributed to its special qualities, such as durability, hardwearing nature, resistance towards strong pH conditions and ability to withstand extreme high or low temperatures. Although granite is one of the strongest natural stone with Mohs hardness rating of seven, it requires maintenance and care just like any other natural stone. In case it is used in semi-exterior spaces as stone countertops in outdoor kitchens, it requires even more care. 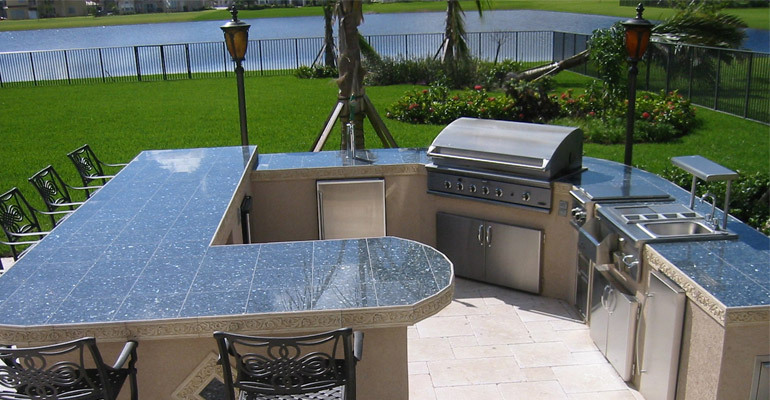 Outdoor kitchen is not at all a new concept, but is a kind of unique and amazing addition to any property. Whether it is about hosting a sizeable group of guests for a celebration or unwinding with your family in your property’s open space, outdoor kitchen is always a preferred choice. It not just offers you ample of space to eat and relax, but also helps in enhancing the aesthetics of your property. The open-plan concept further makes the process of cooking hassle free. An outdoor kitchen looks even prettier, if natural materials are preferred over artificial stuffs for enhancing its functionality and looks. Metal barbeques, wooden patio furniture and stone fire pit are several outdoor kitchen essentials that are very much natural and add substantial values to the kitchen. Apart from all these stuffs, one more thing that is of great importance, which bears nearly all the loads of utensils and kitchenware and also serve as a base for all kitchen-related activities like cutting, chopping, kneading and cooking. Yes, you guessed that right..!! It is the countertop. Just like other natural components within the kitchen, a countertop should be of a material that is not just natural, but highly functional and hence, nothing could be a better option than granite as it fulfils all such requirements. Like other natural materials, granite is eco-friendly and can last a lifetime if properly maintained. Undoubtedly the new granite countertop, especially in polished finish looks very stunning with a highly glossy surface. But, chances are there it may lose its shine and attain stain and scratch marks with continuous use and exposure to elements over the time. Hence, regular maintenance and care is required to preserve its shine and extend its life. Sealing is an option, which makes the granite surface completely non-porous. Spills over the surface can create marks and stagnant water or other fluid may seep into the granite if not properly sealed. Hence, a fabricator should be consulted for the possibility of applying a sealant on the granite surface. For general cleaning, a soft cotton cloth and mild soap/detergent solution is sufficient. Gently wipe the food spills, stains, water marks, outdoor grimes and pollens from the surface and then dry off with a dry cloth. To prevent gunk buildup on granite surface, it is recommended to keep the countertop covered when not in use. Similar to other natural stone, granite is prone to natural weathering and aging. 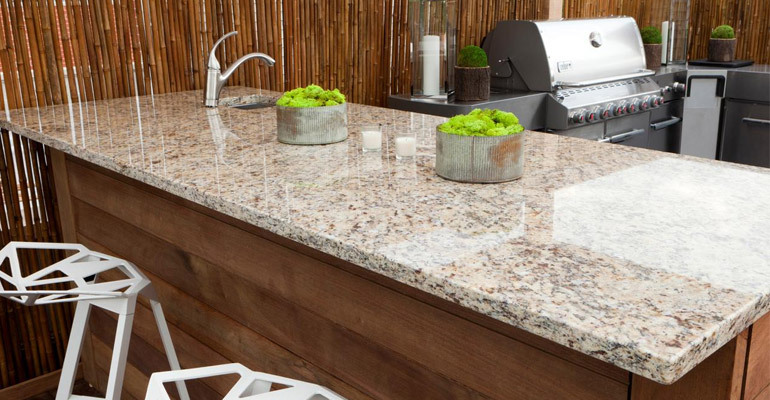 Elements like sun, snow and rain can impact the outdoor granite countertop and wear away its texture and new looks over time. This can’t be ceased completely, but can be slowed down by covering it when not in use and re-surfacing the countertop on a periodic basis or whenever required. There are a number of natural stones that have been designated and sold as “granite” across the globe. All these granite have different colors and streaky patterns as well as chemical and physical properties. It is suggested that a small sample of granite should be tested for porosity and resistance to acidic and alkaline environment prior to installation. Moreover, the rate of weathering varies for different stones and so, different stones are supposed lose their shine and become dull at different time intervals. Hence, requirement of re-surfacing and periodic sealing may also vary for countertops from different granite variants. Places where granite countertops are frequently exposed to damp and highly humid weather conditions, it is suggested to keep the granite sealant free. This allows the granite top to comes in direct contact with the air and prevent moisture to get trapped within the granite surface. Though granite is least affected by high temperatures, it is still not a good practice to keep it continuously exposed to sun. During scorching summer days, especially after min-noon, the exposed granite becomes too hot to be touched with bare hands. This should be avoided by providing it with some sort of shade by umbrella or awning. With this, it becomes comfortable to use or sit near granite countertops. Likewise, minimum exposure to frost conditions and snow can extend the life of outdoor granite top. Outdoor granite faces maximum problems in regions that observe distinct phases of seasons in a year, which create a continuous cycle of freezing and thawing. In case a metal sink is attached somewhere in between the outdoor countertop, then expansion and contraction of the metal may build enough pressure to cause a crack in the granite slab. 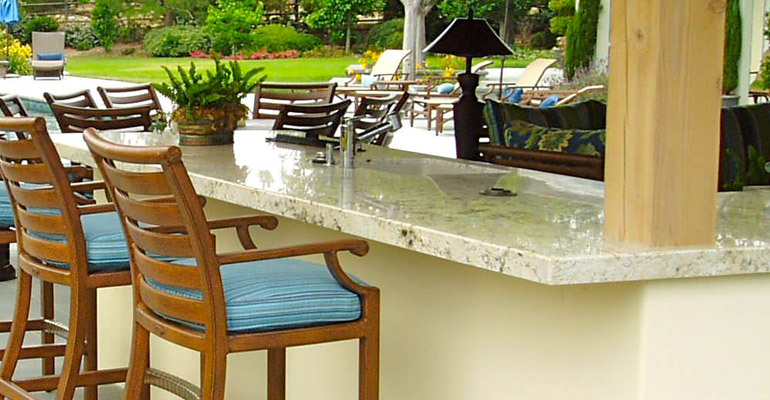 It is therefore recommended to seek advice from your outdoor granite countertop supplier and installer on its maintenance and pocket-friendly ways to ensure its longevity.